Check out the latest new interview with Ebbe Altberg CEO of Linden Lab talking about the future of Second Life and Sansar. Wagner James Au interviewed Ebbe Altberg for 45 minutes at Linden Lab HQ in San Francisco in March 2019. They chatted about efforts to grow new user growth, land discounts, the upcoming mobile companion app, cloud deployment, improving performance and much more relating to Second Life. With Sansar they chatted about the low usage numbers since the beta launch, Sansar’s long download times and efforts to optimize Sansar. It’s incredible to think Ebbe Altberg has now been with Linden Lab for over five years and he has achieved a great amount over the years from reducing land costs, the roll out of Mesh, Bento, Animesh, improved the communications with the community, improved the experience for premium members and much more. The new IOS mobile companion app is being worked on. It’s going to be focused on being connected with friends, chat, shopping, customer service and more. The lab are not considering it to be a viewer in the short term. The lab are focused on continuing revenue & user growth for Second Life. For more specific highlights from this interview see here. It’s been confirmed this week that Linden Lab are in the early stages in working towards an iOS companion app for Second Life. The lab are focused on getting a prototype out to the Second Life community at some point in the near future. The app will not be linked to a streaming service. As you point out, we discussed at our Town Hall events last year that we’re actively looking at ways to extend the reach of Second Life to new audiences including mobile platforms. For example, we’re in the early stages of work on an iOS companion app for Second Life. Right now we’re focused on getting a prototype out to our Residents, at which point we’ll be looking for feedback and suggestions. In the early stages, we will not be tying the app to a streaming service. However, we don’t have anything to formally announce yet about the specific features, capabilities, and availability. It’s important to mention that Linden Lab have not formally announced anything yet. It’s early days but it’s good news to hear the lab are working on an iOS mobile app and hopefully they will make one for Android users. Are you excited about having Second Life on mobile ? Oz Linden has announced on the Second Life official blog that the third-party Android viewer “IM to Secondlife” has been blocked from accessing Second Life. Apparently the block was due to serious violations of the policy on the Third Party viewers page. 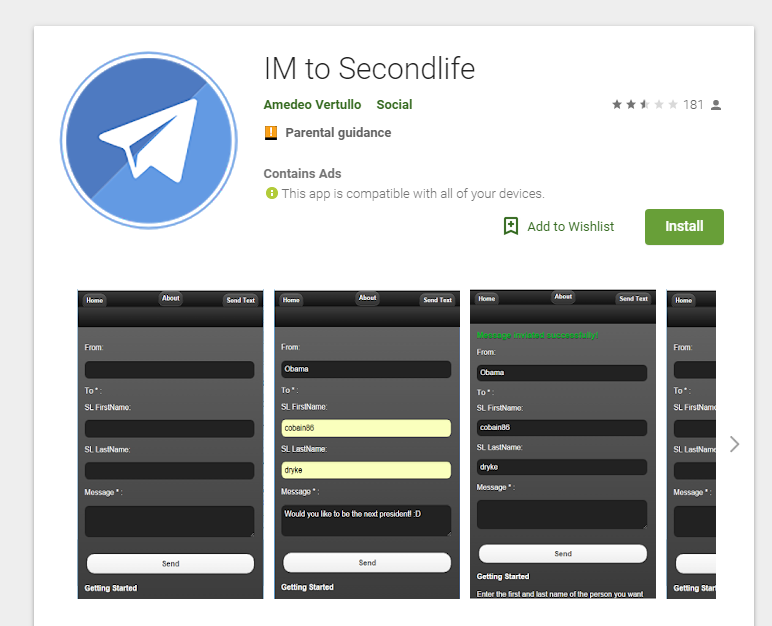 The third-party Android viewer “IM to Secondlife” was released back in September 2015 and since then has been downloaded more than 10, 000 times on the Google Play Store. The reviews have been mostly mixed and negative recently. It’s rated 3 and half stars out of 5 stars. Linden Lab has blocked the third party Android client “IM to Secondlife”; it may no longer be used to access Second Life. We did so due to serious violations of the Policy on Third Party Viewersrelating to user account security and user privacy. It’s good to see Linden Lab taking some serious action to protect the security of the Second Life community.